Today I am going to review a game that was being developed along side ‘Super Mario Bros.’ in 1985 that managed to also set a lot of expectations in the video game industry, ‘The Legend of Zelda’, released in 1986. This is a series I have been aware of for a very long time, but I never had the chance to properly play any of the games. It wasn’t until a couple of years ago that my friend ‘Kate Blackburn’ let me borrow her copy of ‘The Legend of Zelda Collector’s Edition’ for the ‘Nintendo Gamecube’. I was enjoying playing through ‘The Legend of Zelda Ocarina of Time’ and I got my own copy for Christmas 2012. Now be aware that although I have my fun with the series, I am not a big ‘Zelda’ fanatic. These are the types of games that I will have fun with and maybe wait a while before picking them up again. But enough with my personal history with the series, I am going to see if the one that started it all still holds up today. This is my review of ‘The Legend of Zelda’ for the ‘NES’. The story of the game takes place in the land of Hyrule. 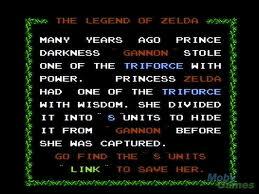 The ruler of the land, Princess Zelda, was kidnapped by the evil wizard Ganon (Gee, does that plot sound familiar?). The reason that Ganon kidnapped Zelda was because he wanted her piece of the Triforce, which are three legendary golden triangles that represent a different attribute. Ganon holds the Triforce of Power while Zelda wields the Triforce of Wisdom. The third piece is the Triforce of Courage which we never see in this game. Before Zelda was kidnapped, she broke her piece of the Triforce into eight pieces and scatters them all over Hyrule. A young boy hears about this and decides to gather the Triforce pieces scattered across the land and save Zelda from the clutches of Ganon. The player can give the young boy any name that they like, but officially his name is ‘Link’ because ‘Shigeru Miyamoto’ (who also developed ‘Super Mario Bros.’) wanted this character to represent the link between the player and the game. The story is pretty much on par with the simplicity of ‘Super Mario Bros.’ story and like I said in that review, story wasn’t really important in a video game back then. The game is an action-adventure game with an overhead view. You use the D-Pad to move up, down, left and right. The ‘A’ button lets you stab with the sword and the ‘B’ button lets you use an item from your inventory. The start button takes you to your item inventory where you can change the item you want to assign to the ‘B’ button and the select button pauses the game. Now when you first start out, Link does not start out with the sword. To get your first sword, you first need to go into the cave in the area where you start out and an old man will give you a wooden sword. When Link is at full health, he can shoot a beam from his sword which can damage enemies. Link also possesses a shield that can block some projectiles when he isn’t attacking with the sword. The game itself is incredibly non-linear. You are not told where to go or what to do so it is up to you to travel all over Hyrule to discover the many secrets and dungeons to find the pieces of the Triforce to save Hyrule. 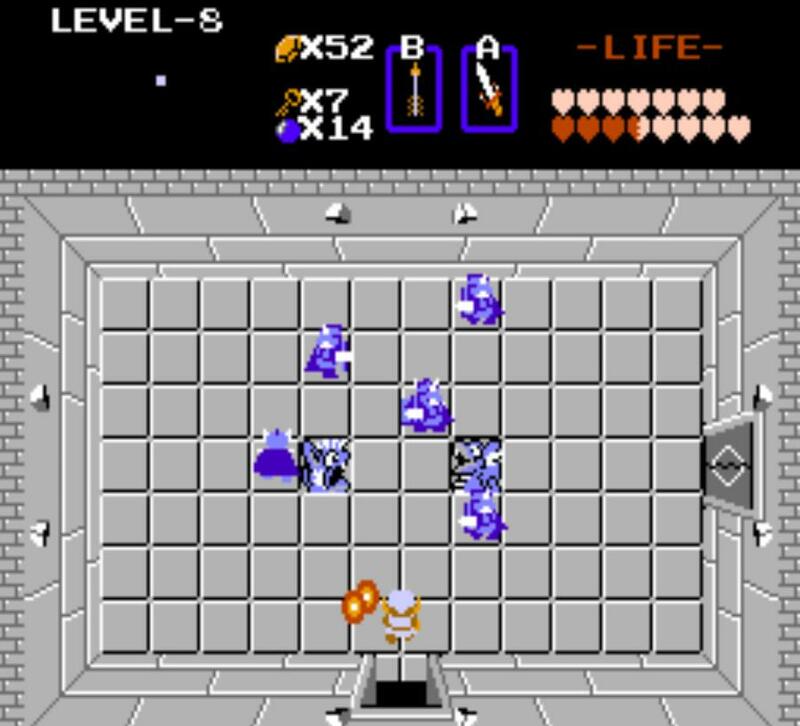 There are shops across Hyrule that can sell you a number of items such as bombs which you can use to blast specific walls to find secret passageways, a blue candle that can burn specific bushes and light up dark rooms in dungeons, a magical shield that can block magical based attacks and a blue ring that can increase your defensive capability. In order to buy these items, you need rupees which is the currency of Hyrule. You get rupees by killing enemies and finding secret passageways all over Hyrule. Make sure you have a lot of rupees as most of the items mentioned before are very expensive. 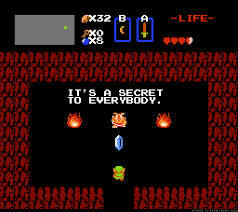 The secrets found all over Hyrule can range from a number of things. They can be hidden shops that sell you items at a discounted price, a place that gives you a chance to earn more rupees, a place that can give you a potion that restores all of your health or an extra heart container or it can be an old scumbag who forces you to pay up for breaking down his door (even though it never looked like a door and he could have been trapped in there for all of eternity). However finding these secrets by yourself is a massive chore because all of the burnable bushes and the bomb-able walls look exactly the same from every other bush or wall. Let me just say this right now, ‘The Legend of Zelda’ is a game that requires you to have a guide for you to have any sort of enjoyment. 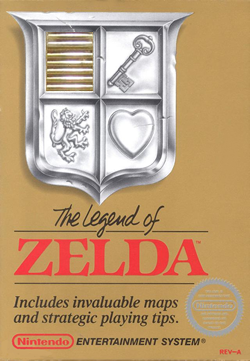 When it was first released, it came with a map of Hyrule and a detailed manual that offered you all sorts of hints to make your journey more comfortable overall. There are old men throughout the game that offer you hints, but they are very cryptic and out of date compared to today’s standards. Without the map and the guide, you will spend most of your total game time incredibly confused with no idea where to go next. Hyrule does not contain any memorable set pieces that players will recognize and worst of all the in-game map is totally worthless. The game’s HUD consists of what items are assigned to the ‘A’ and ‘B’ buttons, how much health you have, the number of bombs you have as well as the number of dungeon keys and rupees and a big blank grey box that is supposed to be your map of Hyrule. The map you get with the game is required to find all of the secrets and dungeons with ease, so if you decide get this game used you will be screwed up the posterior (as you can tell, I’m not much of a swearer). The dungeons are where the real action is. Inside the dungeon, you need to get to the room where the Triforce piece is. In order to get to the room, you need to find keys, which you can get in certain rooms normally or by defeating every enemy in the room. 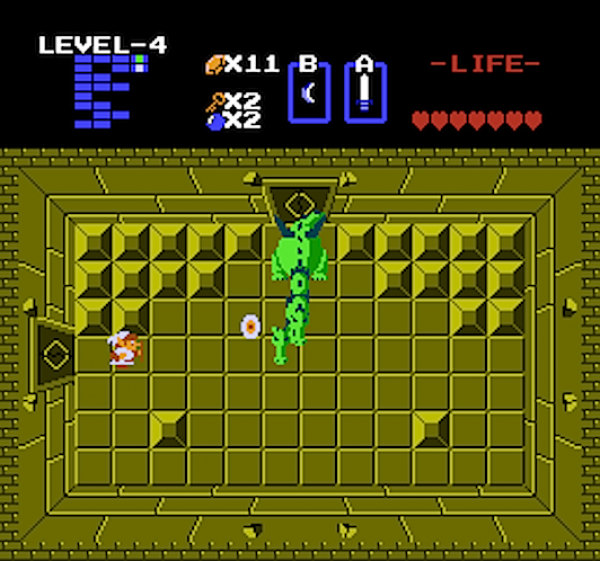 You will also need to get a special item in each dungeon in order to progress with the rest of the game, such as a raft which lets you cross over the sea to get to the fourth dungeon, a stepladder which lets you cross over one space of water and a master key which acts as an infinite library of keys to let you proceed through the dungeons with ease. To find the Triforce piece more easily, you need two items. The first item is a map of the dungeon which actually works better than the map of Hyrule and a compass which tells you the whereabouts of the Triforce piece. You fight a huge variety of enemies along the way and let me tell you, most of them have the weirdest names you will ever hear. The mummy enemies are called ‘Gibdos’, the bouncing rabbit heads are called ‘Pol’s Voices’, the bats are called ‘Kese’ and the snakes are called ‘Rope’. (That has to be really confusing for tourists in Hyrule. Incidentally I want to make an animation making fun of this when I have the time so keep a lookout for it.) Most enemies are easy to take down, but there are a couple of enemies that I absolutely cannot stand. The first of these creatures are my most hated creatures in the game, ‘Darknuts’ (I would make a dirty joke, but I am too much of a gentleman). They can only be attacked from the side or behind. The problem is their movement patterns are random and they never stop moving. Also when they get hit, they do not get knocked back like most enemies would. The blue ‘Darknuts’ are even worse because they move faster, hit harder and take more hits to kill. My second most hated enemy are ‘Wizrobes’ which like to teleport and throw magical attacks at you. The blue ones on the other hand like to move around the room and they never stop moving nor get knocked back. If they catch you in their line of sight, they will throw magic at you. There are also these burning disco skulls that will not damage you if they touch you, but you cannot use your sword for a few seconds if they touch you. The last of my despised enemies are the ‘Like-Likes’ (yes, those are their names) because if they latch on to you while you are armed with the magical shield, you have to kill them as fast as you can otherwise they eat the magical shield and unlike other ‘The Legend of Zelda’ games, you cannot get it back from the ‘Like-Likes’ after you kill them. You do encounter bosses before you enter the room with the Triforce piece and honestly they are easier than the enemies you encounter in the dungeon. Some bosses require a special item to defeat them. For example, the boss ‘Digdogga’ (no it is not a dog) needs to be weakened by the flute before you can attack it with the sword. When you kill a boss, you get a heart container which permanently extends your health meter as well as access to the room with the Triforce piece. 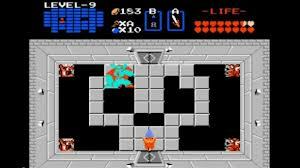 After you collect all eight Triforce pieces, you can finally access Ganon’s Dungeon at the top of Death Mountain. This dungeon is my least favourite part of the game. This is where I needed a guide the most because the dungeon itself is huge and there are a lot of rooms that go absolutely nowhere. There are two items in the dungeon that you will definitely need if you plan on beating the dungeon. The first is the red ring which maximizes Link’s defence and the second item is the silver arrows which are absolutely necessary if you want to beat the game. When you finally reach Ganon himself, Ganon becomes invisible and moves around the room throwing fireballs at you. In order to beat him, you need to guess where he is and stab him. You can use the fireballs as a clue to see where he is. Once you damage him enough, you use the silver arrows to finish him off. Everything else is useless against him. Once you defeat him, you proceed to the next room where Zelda awaits thus completing the game. After the credit sequence, the game gives you the option to try the second quest of the game which is basically the hard mode of the game complete with different dungeon layouts. i have yet to try the second quest but I don’t think I will even bother. The graphics for this game I think are just as good as ‘Super Mario Bros.’ graphics. Apart from the secret bushes and walls, everything manages to stick out from each other and the sprite work for an 8-bit game are pretty good. Musically speaking, the music tracks are incredibly short and they last for about between ten to twenty seconds before looping, but some of the songs are pretty entertaining such as the theme for Hyrule which will become the main theme for the series and the end credit music is really catchy. Control-wise, it has become very ancient and archaic. Link cannot move and swing his sword at the same time and since he has to constantly stop and stab enemies, it isn’t really that effective in terms of coverage. It isn’t the worst control I have ever experienced, but it hasn’t aged all that well. Well although I am expecting most people to disagree with me, I like to be honest with my true opinions on the games I play. I do not think this game has aged entirely well. Do I think it is a bad game? No. Although it hasn’t aged as well as ‘Super Mario Bros.’, that does not change what it managed to do for the video game industry. I just think that as a game in the world of today, this certainly won’t be for everyone. I can only recommend this game for video game enthusiasts because not only can it be confusing, it can also be pretty difficult. It requires a lot of patience to beat this game which I know not everybody has a lot of. Hyrule is pretty barren for my liking and it doesn’t help that the people who do offer you hints are not really helpful. For example, when you see a couple of men who can give you upgrade to your sword, they say you must master it before you can use it, which implies that you get to practice with it before you can use it. What they really mean is you must collect more heart containers to extend your life meter to a certain point before you can use the sword upgrade. I hate games that are cryptic about their hints like this and the ending certainly left a bad taste in my mouth. However one thing I do like about this game is that it actually has a save feature. 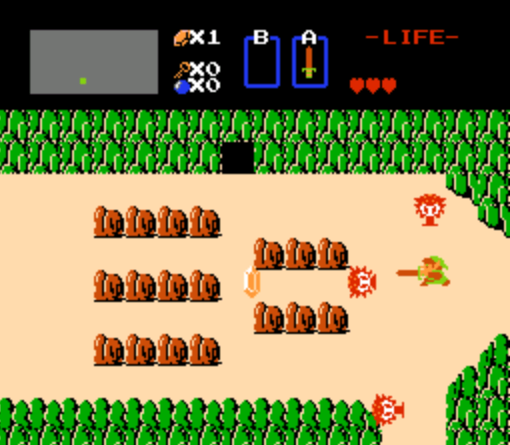 ‘The Legend of Zelda’ was one of the first games that had a save battery that allowed players to save their progress without typing in a long password. Back in the 80s, something like that was amazing and it only further cemented one of the expectations this game set for the industry in general. So overall I don’t consider this to be a bad game, but I think it is too ancient and confusing for the modern video game players to enjoy.